New Version: Creation a 'New Version' of the schedule based on the current version. Version Info: Edit the description, title and purpose for the current version of the schedule. Summary: Generate 'summary' statistics of shifts and hours for providers for the current version of the schedule. 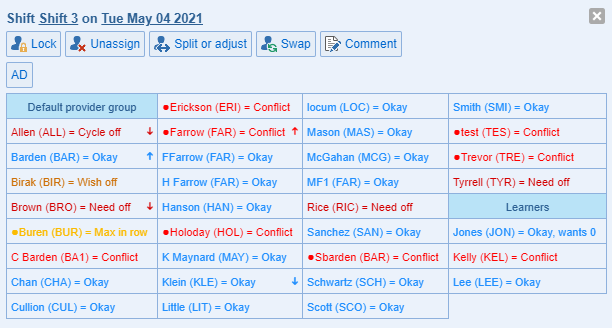 Note: The maximum number of shifts in a row and categories in a row are available in the right most two columns in the summary for a schedule version. Manage providers: Add or remove providers from this version. Provider Settings: Edit the hours and shift request, shift sequences, and shift preferences for providers for this version. Short term provider information only applies to current version. Providers who are marked as 'Can't do' for all sites currently selected can be shown in the provider settings screen from the schedule revision screen. Note: The Provider Settings screen layout omits the scroll bar in the provider table when viewed in a low resolution display. Shift times: Modify the start and end times for a shift in this version of the schedule. In schedule versions, shifts can be locked, unlocked assigned, and unscheduled by any combination of providers, categories, sites shifts, and date. Provider comments: Show the comments entered by the providers. Automate: Create or revise the schedule using the automated schedule optimizer. As each shift is scheduled, the name of the newly scheduled provider replaces the blank line that had previously represented the unscheduled shift. Depending on the speed of your computer and the complexity of your schedule, the entire scheduling process requires anywhere from a few seconds to several minutes. Clear: Clear computer assigned scheduled shifts and restart scheduling from scratch. In some cases, the automation will leave some shifts unscheduled based on the dependencies for these shifts ('Need off', 'Can't do', 'Shift Relations', and 'Biases'). Rerunning the automation one or more times will fill often assign the unfilled shifts, but not always. Ultimately, some manual assignments using the shift provider popup maybe necessary. The automation will typically favor rules regarding sequences of shifts over rules for shift preferences. This prioritization of rules can cause disliked or highly disliked shifts to be assigned to providers. It is best to 'build up' the shift preferences, starting with the most important ones and adding new ones while checking the impact on the computed schedule. As detailed earlier, some preferences may be ignored by the automation to favor other more important rules. Consequently, if a large number of preferences are defined, it is likely that some will not be honored by the automation. 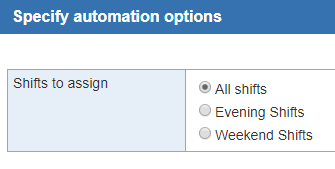 'Specify automation options' is available to location where the category used for max-in-a-row is the same as the category for either the high, medium, or low priority workloads. The 'Evening Shifts' or 'Weekend Shifts' pre-scheduled in this way can be locked using the 'lock' option in the automation option screen. After the evening or weekend shifts are pre-scheduled, the rest of the schedule can be automated. Note: At present, the automation does not take into account provider speed. Select Sites: Select the sites to display in the schedule. The selection of sites to show in the schedule is preserved while navigating to other pages from the revision edit screen. Upon return to the revision screen, the sites shown will be as selected previously. Filtering by shift is now available from the 'Select Sites' tool. Filtered shifts have been excluded from printing. Email Schedule: Send a PDF of the current schedule to providers by email. Notifications: See current notifications for schedule changes. It keeps track of all the changes you made to the current version. The number will increase upward if there's any notifications. You have the option to dismiss these notifications by selecting 'X' or 'Clear'. Minimum number of days adjacent to the start and end for the current period to show in the revision screen is now available within the revision screen. The option applies to days both before and after the end of the schedule. Change shifts: You have the option to add/remove 'Day types' or 'Individual shifts' from a range of days in the schedule version. Designate holiday: If you forget to add a holiday, you can use the 'Designate holiday' option. Schedules within 16 months of the start of the current schedules are now shown in the schedule selector. After switching schedule through the selector, the schedule is editable. A new option is available in the 'location' screen, 'schedule tab' to keep the previous behavior (show only the previous and next schedule in read-only mode). 1. Location menu: Location administrators at more than one location can switch between locations from within the schedule revision screen. 2. Toggle editing of scheduler comments (CTRL + 1): Enter a comment that you wish to make available to everyone with access to the schedule. The 'Toggle editing of scheduler comments' icon will display at the bottom of each day. 3. Toggle editing of provider comments (CTRL + 2): Enter a comment that you wish to have printed at the bottom of this day on your personal schedule. Note: The comment editing mode for either provider comments or scheduler comments can be toggled on or off in the schedule revision screen and the request screen. 4. Show the individual calendar for the provider currently selected (CTRL + 3): Facilitates the review of individual provider schedules by displaying only the shifts scheduled for the currently selected provider. This allows review at a glance of all scheduled shifts for an individual provider. To perform automated scheduling, you will usually want to know which shifts in the schedule each provider has requested not to work (i.e., will be off) due to vacations or other obligations. Select the 'View and manage shift requests for providers' icon or CTRL + 4. Then, click on the drop down menu to select the provider's name.The provider's requests will be displayed in the schedule. You have the ability to make changes for your providers. Click on the menu next to the number of the day. The menu will display the following options Need off , Wish off, and Available for the specified provider. Requests for a schedule are not specific to versions of the schedule; all requests apply to all versions. Keyboard Shortcut: Select the 1st option (Need Off, Wish Off, or Available) for the start date and then click the Shift key + Need Off, Wish Off or Available on the end date to mark multiple days off for a provider. *Please note that Need off shifts are different from 'Can't Do Shifts'. 'Off Shifts' are specific shifts in the current schedule for which the provider is not available to work due to other obligations. 'Can't Do Shifts' are named shifts, such as Clinic shifts, that the provider cannot be scheduled for at any time in the schedule. Need Off: You are unable to work this shift. You can by pass the menu options and directly make this entry by selecting the letter 'N + click' on the shift. The letter 'N' highlighted in a pink background will be displayed and the font color for the shift name is pink. Wish Off: You do not want to work this shift, but you're available if the shift cannot otherwise be scheduled. 'W + click' is the shortcut combination.The letter 'W' highlighted in a green background will be displayed and the shift name will be shown in italic orange. Available: You wish to remove an existing 'Off' or 'Request On' designation for a shift and return it to being simply 'Available' (available to work). 'F + click' is the shortcut key combination. Note: Selecting the 'Available' option will not affect shifts that your schedule administrator has designated for you as being 'Can't Do'. 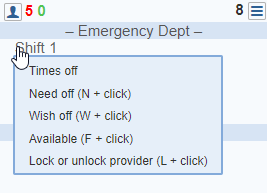 Lock or unlock providers: In the manage request view of the schedule revision screen, the provider currently selected can be locked to a shift through the menu for the shift or shortcut 'L + click'. Show all off: Requests from shifts and days off, assignments to shifts, and time off requests are available in the revision screen for each day in the schedule. Red numbers correspond to the off request (number of providers with either cycle off, need off or wish off requests) for the day. Green numbers corresponds to the number of assignments request (request on) to shifts for the day. Select the 'Admin' tab > 'Edit Location' button > then click the 'Provider requests' to display the 'Off reason tracking' section, where you can track the following reasons when a shift is requested off more specific by selecting or creating reasons such as 'Vacation', 'Admin' (administrative duties), 'CME' or 'Personal'. Which explain why your providers are taking a shift off. There are also, 2 custom fields you can use. Optional: If 'Off reason tracking' is set up, you can make your 'Need off' or 'Wish off' requests for the day more specific by holding down the appropriate letter key before clicking the date; 'A' for admin, 'C' for CME, 'X' for personal, 'V' for vacation. Right click to use combination with the letter to make the day 'Wish off'. As suggested by you the schedule administrator, you can make your 'Need off' or 'Wish off' requests more specific by selecting any of these four reasons - Admin (administrative duties), CME, Personal or Vacation. Which explain why you are taking a shift off. You can by pass the menu and make these entries by clicking on the shift using the shortcut key combinations below. 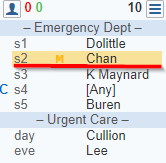 If the current provider has any named shifts 'Can't Do' (they were entered in the 'Shift Preferences' screen), these are marked with the letter 'C' is highlighted in pink next to the shift name 'C'. This indicates that the selected provider will not be included in the automation of the schedule for any of these shifts. You do not need to enter these shifts as off shifts from this screen. They are automatically not scheduled because the provider cannot work these shifts. If you 'prohibit biased' a provider for any 'summary category of shifts', all affected shifts are marked as the letter 'H'. This indicates that the provider will not be scheduled for any of these shifts during automation. You do not need to enter these as off shifts from this screen. They are automatically not scheduled because of your 'Bias' entries. Any shifts for which the current provider is lock scheduled or cycle scheduled are displayed with a green background. Administrators can either preserve or remove cycle off request when creating a new shift request that overlaps with cycle off requests. Note: The TAB key allows to quickly switch between the assignment mode and the request mode in the schedule revision screen. 6. 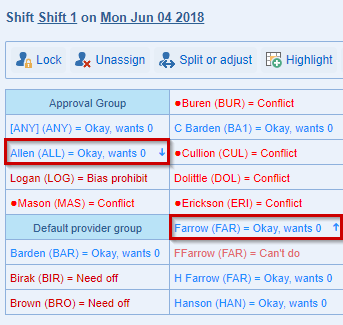 Highlight scheduling conflicts or clear highlighting of scheduling conflicts (CTRL + 5): Any shifts for which providers are scheduled that they 'Can't Do', they requested off, exceed the number of max in a row shifts, which conflict or clash with another shift that they work, or for which they have a 'Prohibit bias' are highlighted. Schedule a provider for a shift that they normally 'Can't Do'. ByteBloc will display a warning if you request this, but will allow the change if confirmed by you. Schedule a provider for a shift that conflicts with an already scheduled shift for that provider. ByteBloc will display a warning if you request this, but will allow the change if confirmed by you. Schedule a provider for an additional day in row that they normally don't work 'shift in a row' that did not previously exist for the scheduled shifts. Change a provider's availability, adding an off request for a shift that is already scheduled for a provider. ByteBloc will display a warning if you request this, but will allow the change and leave the scheduled shift if confirmed by you. Change a provider's shift relationship requests, creating a conflict shift relationship that did not previously exist between two scheduled shifts. Change a provider's shift preferences to create a 'Can't Do' preference that did not previously exist for a scheduled shift. Change a provider's bias settings to create a 'Prohibit bias' that did not previously exist for a scheduled shift. Note: The ease of scheduling is based on 'hard' constraints only (can't do, clash, conflict, cycle off, need off, prohibit). 'Soft' constraints such as wish off are not considered. 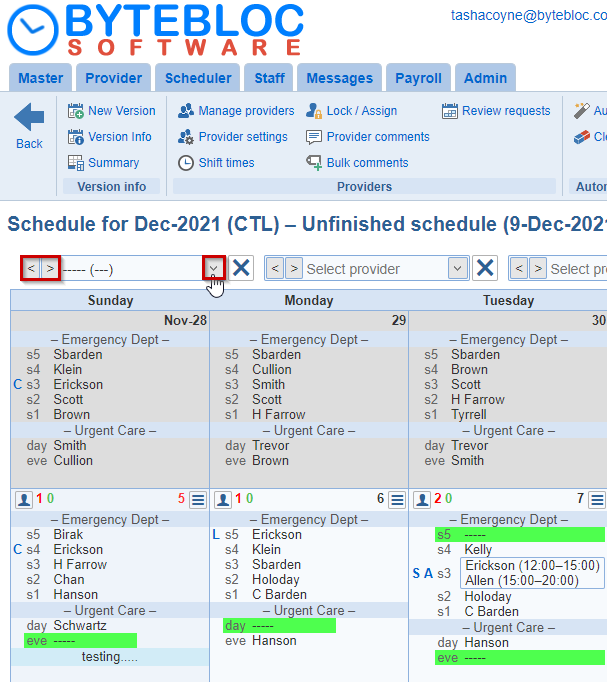 In the schedule revision screen, the tools to edit the scheduler and provider comment, view individual schedules, manage requests, view conflicts and view hot spots are available in the floating toolbar. Additionally, keyboard shortcuts are available for these tools: 'Scheduler comment (CTRL+1)', 'Provider Comment (CTRL+2)', 'Individual schedule (CTRL+3)', 'View conflicts (CTRL+4)', 'View hot spots (CTRL+5)', and 'Maximize/minimize schedule (F11)'. 8. Show provide speed (Ctrl +7): You can show shift assignment in the context of provider speed by using a tool or pressing CTRL+7. In this view, fast providers are identified with an arrow pointing upward and slow provider with an arrow pointing downward. 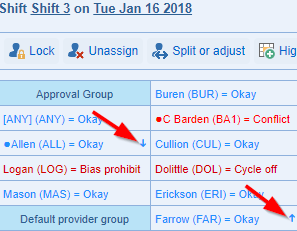 Note: Co-assignment of shifts for shift starting within 3 hrs of each other are highlighted in yellow when the providers assigned are both fast and in red when the providers are both slow. Provider speed can be displayed in the schedule revision screen. Conflicts resulting from concurrent assignment of fast providers or slow providers to speed sensitive shifts are highlighted. Select provider print names from the menu to view individual providers schedules. You can type in the abbreviation, use the back and forward arrows plus, use Up and Down arrow keys on the keyboard to scroll for a provider within the revision screen. Up to 30 providers can now be seen without scrolling in the provider selectors. Unassigned shifts can be highlighted using the provider selector in the schedule revision screen by selecting ---- as the first provider. The abbreviation is (---). When a provider is selected in the schedule version screen, the highlighting of the shifts assigned to the provider takes into account the dependency for the shift and the provider. Lock: Lock or unlock the provider to the shift. Pressing the 'L' key while selecting the provider also works to lock. Unassign: 'Unassign' provider from shift and make temporarily off for the day. Split or adjust: 'Split' shifts between several providers or 'adjust' the hours worked for the shift. Highlight: In the revision edit screen, highlighting is done through the provider popup (from the shift). 'Highlight' applies to 'As-scheduled' and 'As-worked' revisions only. Swap: The assignments of providers to two distinct shifts can be exchanged by using the swap function. To start an assignment swap, click on shift and select the swap tool. Alternatively, click on the shift while pressing the 'SHIFT' key. The shift will be highlighted, indicating that a swap is in progress. To complete the swap, select the second shift and use the swap tool again. Clicking on the shift while pressing 'SHIFT + Click' is supported also. Note that the swap function can be used on unscheduled shift. To cancel a swap in progress, press the 'ESC' key or use the swap tool on the assignment used to start the swap. 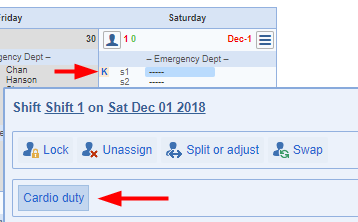 When the provider menu is open in the variant edit screen (after click on a shift assignment), a provider can be scheduled for the shift by typing their abbreviation. Custom 'tags' can be defined and applied to shifts by selecting this option. When a provider is selected in the shift assignment popup using 'CTRL+ click', then the provider popup remains open and the next shift is selected for the day. On the Mac, you can use the command key instead of the CTRL key. Typing the abbreviation when the provider popup is open will assign the shift to the provider. Clicking on the shift should hide the popup now. The provider popup can be closed by pressing the 'Esc' key or clicking on the close ('x') icon. Additionally, the popup can be moved on the screen using drag and drop. The 'Lock' tool in the shift assignment popup is not available when a shift is split. Locking is not meaningful for a split since the automation will not change the assignments for a split. The speed of the providers is also shown in the shift detail popup to the right of the dependency for each provider. The prescheduling calendar screen is displayed after creating a new schedule. The title is known as 'Prescheduled shifts'. All the shifts will be empty unless you have providers set up for cycle scheduling. A 'C' will listed next to the provider's name if their set up on a cycle schedule. You have the ability to lock in providers for a holiday or any day before releasing the schedule requests. If you selected a provider and they're not scheduled for a shift, but you see the letter 'L' it means someone else is locked in for that specific shift. Use the Delete key or the Backspace key to delete providers from an edited variant screen in the Scheduler portal. Left-click on the shift, and then select the Delete key or Backspace key to remove a provider. Are there any changes to the normal customization information that you want to make specifically for this schedule? You can change 'Provider Settings' for numbers of shifts, hours, shifts in a row and shift preferences. Optional: You can add a 'Scheduler comment' to the schedule before releasing. Select the 'Toggle editing of scheduler comments'. If you need to add a 'Provider comment' for one of your providers, select the provider name from the 'Select provider' drop down menu. Then click on 'Toggle editing of provider comments' (CTRL + 2). Provider comments are displayed when you are viewing that provider's availability as a reminder of why the day was requested off. You have the ability to update 'Shift times' in the 'Provider' section in the top menu. 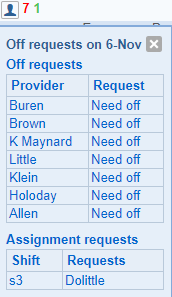 Enter in schedule requests: Select the provider's name from the 'Select provider' drop down menu. Click on 'View and manage shift requests for providers' option will appear. (It looks like a calendar.) Here you can inform ByteBloc about the shifts that your providers have requested off in the current schedule. If you prefer to release the schedule requests to the providers: Click on 'New Version' to create the schedule request. In the 'Version purpose' drop down menu, select the 'Requests' option. Optional: Extend publication request close date/time within the 'Manage' screen or the 'Version Info' window. Create a 'New Version' as a working revision. You can name the 'Version description' whatever you want. Highlight shifts based on likely easiness to schedule (CTRL +6): A metric indicating the likely easiness with which shifts can be assigned is available from the 'hot spots' tool in the schedule revision screen. 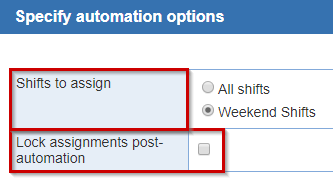 Automate: If you prefer to do automation, click the 'Automate' button after you have entered all necessary lock scheduled and off shifts, and made any changes to provider request specific to the current schedule. 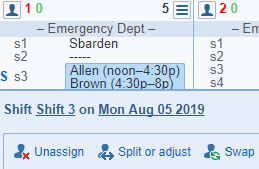 As each shift is scheduled, the name of the newly scheduled provider replaces the blank line that had previously represented the unscheduled shift. Depending on the speed of your computer and the complexity of your schedule, the entire scheduling process requires anywhere from a few seconds to several minutes. Otherwise, you can schedule manually. After computerized scheduling is complete, you may then review and 'Clear', modify and distribute your schedule as desired. Provider Settings: Edit the hours and shift requests, shift sequences, and shift preferences for providers for this version. Summary: Click the 'Summary' button if you want ByteBloc to display the shifts and hours statistics for the schedule, showing totals for any cycle scheduled, locked and off shifts that you have entered. The summary categories you defined in the 'Customize schedule' of the 'Scheduler portal' are used to create the display. When accessing from the revision screen now includes columns for 'in row shifts' and 'category in row shifts'. Highlight one provider: Use the 'highlight one provider' option by selecting a provider from the provider drop down menu. If you want ByteBloc to review an individual provider's schedule, highlighting all of the shifts worked by that provider. You can use this to easily confirm that cycle and lock scheduling is correct. Summary and shift availability information specific to that provider is also displayed. Show All Stats: A quick view of the statistics for a specific provider selected in the drop down menu located at the bottom of the screen. You can mouse over 'Show all stats' and it will display all categories. If you want to look at report click on 'Summary' from the menu navigation. When the statistics are computed for a single provider, as is the case when a provider is selected in the schedule version screen, the target displayed did not reflect the correct number of shifts in the case when was set to either equal (=) or percent (%). Rather than displaying the target as a number of shifts or hours in this case, it is shown now as either = or %. The actual number of hours or shifts can be viewed in the 'Provider Information' or 'Summary' screens. 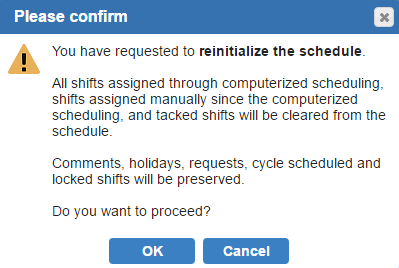 In the revision screen, statistics for unscheduled shifts are display when the option '---' is chosen in the provider selector. In the 'View and manage shift requests for providers (CTRL + 4)' screen, when a provider is chosen from the provider selector, statistics are now displayed. Optional: Print a copy for your records. Publish finished schedule: Create a 'New Version' as an 'As-scheduled' version. The 'As-scheduled' version becomes the current 'As-worked' version. All schedule changes are made in the 'As-worked' version for the current schedule period. 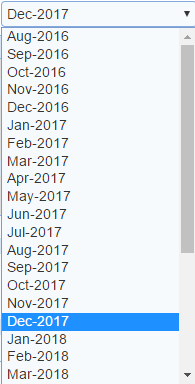 Increase or decrease the font-size on the schedule by clicking on the letter A's on the top right corner above the calendar. To maximize the calendar in the browser click 'F11' on your keyboard or click on the 'Maximize the calendar in the browser' option located on the top right corner above the calendar.